This comprehensive fact sheet pack includes all 11 of our currently available Green Maintenance factsheets, answering some of the biggest questions in green maintenance. Our comprehensive Greenkeeping Fact Sheets pack includes all 11 of our currently available Green Maintenance factsheets, answering some of the biggest questions in green maintenance. 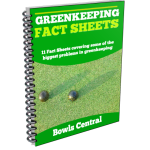 These fact-sheets are the quickest and easiest way to get up to speed with the issues that affect bowling greens and to find answers to some of the most troublesome questions in greenkeeping. Print out and collate into a file for easy reference for your committee, members or greenkeeping staff. Use as posters to communicate key green maintenance issues to members. Use as information to include with green maintenance reports. Get up to speed quickly with the main greenkeeping issues to help you communicate them better to advisers, members and visitors.